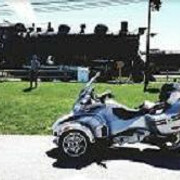 I have been trailering my spyder for about 4 years now it is an SM5. When I strap it down I put it in Neutral with the parking break on. When I get to my destination I notice that the rear wheel has rotated about 1/8 turn. My friend just bought the same trailer as mine. He was told to strap it down in 1st gear with the parking break on, he has an SE6. My concern is that leaving it in gear will put unnecessary pressure on the clutch and transmission with it in gear. On an SE it won't matter because the clutch allows it to roll. I trailered my 2 wheeler across the country twice had it in first gear and it was fine. If you set the park brake on the spyder it shouldn't move. We trailered our SM5 in the back of the toyhauler with parking brake on and in gear. With proper tie downs your bike should be fine. The rotation of the wheel is from the back end bouncing off the floor. When you're trailering, you're really just parking it permanently in one place on the trailer. I was taught on a manual transmission car to put the car in gear when parking it. I see no reason why a manual transmission Spyder would be any more delicate than a car. What does your manual say about how to park it? Does it say to leave it in gear or not? Put a strap over the rear wheel in the travel direction...no more issues!